A University of Wolverhampton student has been awarded a graduation prize by a local employer for his engineering efforts. Richard Stockton, 32 from Wolverhampton, is a Diagnostic Engineer at UTC Aerospace and studied part-time for an Electronics and Communications degree at Telford Innovation Campus. Laser Process, based in Cannock, offers the latest laser cutting technology and is one of the sponsors of the University of Wolverhampton Race Team. They awarded the ‘Laser Process Prize for the Top Performing Part-Time Engineer’ to Richard for his commitment to his studies and high performance as a part-time student. Jonathan Horne, Managing Director at Laser Process, said: “As a company, we already support the engineering race team at Telford Campus and we are an advocate of engineering and manufacturing generally. “We are very keen to promote engineering – especially as a career for young people – because it needs to be recognised as a profession offering a great career path. 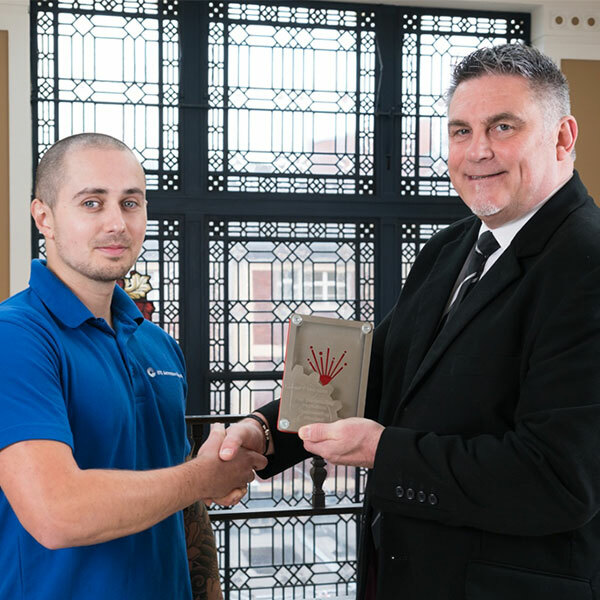 Richard said: “I was quite surprised to receive the award but it is great recognition for my achievement. Picture caption: Richard (left) accepts his trophy from Jonathan (right) at City Campus. Anyone interested in studying Engineering at the University should register for the next Open Day on Saturday 17th November 2018.